Ten days are over. My first word is to thank you. Thanks for all kinds of support. Thanks for sharing my post. 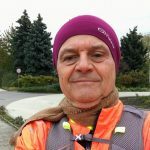 Thank you very much for the donations to Bátor Tábor through my run! I continue working on it, and I expect success! Why? So far, before each goals achieved, success seemed not to be achievable, based on the trainings. “Race day” was different, and it will be in this case too. I appreciate your continued support and kind words. If you find BÁTOR TÁBOR worthy of your financial support, please contribute. Every little help counts!